The installation of the first span of the dream Padma Bridge two months ago made the landmark structure visible also drawing huge onlookers at the site every day, prompting entrepreneurs to chalk up plans to turn it a tourist spot. 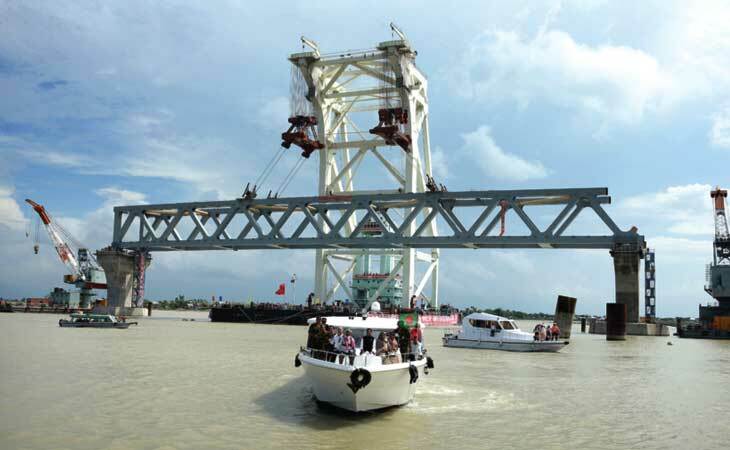 The first span was installed at the scenic southern bank of the mighty Padma River at Shariatpur's Zajira upazila point on September 30 while officials said 52 percent works of the entire mega bridge construction process was completed by now. "But the site virtually appeared as a tourist centre with people from different areas coming here to enjoy the beauty of nature as well to witness the bridge building process," a resident of a village in the neighbourhood told BSS. Deputy Commissioner of Shariatpur Md Mahmudul Hossain Khan pointed out the trend of tourist arrival prompted him to send a proposal to the Tourism Ministry seeking government steps to set up a river-drive, resorts, a golden bridge park and other infrastructures to draw more tourists from home and abroad at the scene. But the local entrepreneurs and business people said by now they took various plans to attract tourists on the southern bank of the Padma River. "We have already planned to set up modern restaurants on the south bank of the river . . . we expect the flourishing tourism industry would generate employment opportunities and vibrate the economic activities," owner of a highway side grocery shop Md Chunnu Miah said. Abu Taleb, another local trader of the bridge connecting road area, said the number of business entities continued to grow in number since Prime Minister Sheikh Hasina inaugurated the Padma Bridge Project in 2012. "Local entrepreneurs are now looking for land to set up resorts, hotels, restaurants and other business entities aiming to start tourism business here," he said. Shariatpur Government College's principal Md Monwar Hossain said the planned development of hotels, motels and other infrastructures on the riverbank at the Zajira point could turn it a world-class tourism spot". "The dream of the people of 21 south-western districts is going to turn into reality by the own effort of the Mother of the Humidity, Prime Minister Sheikh Hasina," BM Mojammel Haque, MP who was elected from Shariatpur-1 constituency said.